I’ve been using Synkron lately to keep several directories synced up across a couple of external drives — a backup of sorts, just in case one of the drives decides to kick the bucket. I’ve also been cleaning up my drive, and something drove me bonkers: I couldn’t figure out why, in spite of my best efforts to clean up the drive, I couldn’t get 100GB free or more on my MBP (total HD size is 250GB). It just didn’t make sense; after all, I’d been able to do it just a couple of months ago, before I filled up my drive with photos from Austria and Romania. Why couldn’t I do it now?! I decided to download Disk Inventory X, a drive space analysis tool based on WinDirStat, which I’d already used on a couple of Windows machines. What do you think was the biggest culprit on my MBP’s hard drive? The Synkron cache. 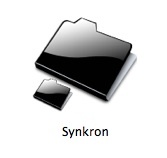 Look, Synkron, you may have a nice, shiny icon, and you may be able to put a nice GUI on rsync or subversion (not sure which you’re built on), but I’m sorry, when you can’t clean up after yourself or at least take up less space on my drive, you’re no good to me — into the Trash you go. If you’re using Synkron as well, and you’ve noticed your free space shrinking inexplicably, you may want to give Disk Inventory X a try, and to consider whether another utility to sync your files may be a better option. I’m not ruling out Synkron completely, and I hope that its developers decide to fix this cache issue at some point. Ahhh, dang. I found this site after experiencing the same problem and just AFTER coming across the same solution! My drive is 500GB but the available space had dropped low as 1GB (so of course I had to act). I use external USB drives for all my files so there was no way I should be down to 1GB on the internal drive. I downloaded the free Disk Inventory X, and bingo — Synkron was using 350GB in an invisible folder!!! It seems to be keeping a cache of each time I backup, so I was accidentally getting a second version and a third version and a fourth version of every file! I think this is a usefull post but not as intended. Synkron feature was misrepresented as a malfunction or at best a shortcoming. Matus shows good form. 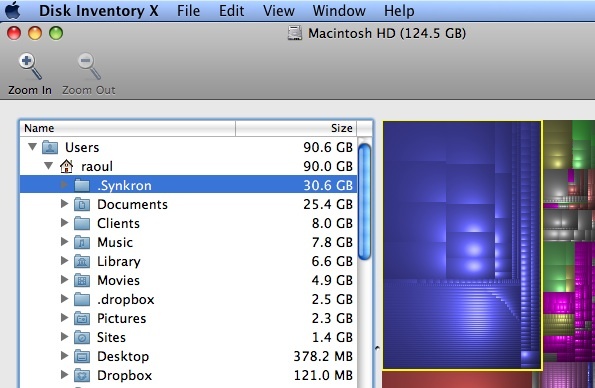 I just found this blog post by chance…I was having the same issue and realized that Synkron had a hidden cache file on my mac that was eating up 365GB of my 500GB drive lol….My head scratching as to where my disk space went has been solved! Backups are a mixed blessing. I’ve used SmartSync Pro 2 for years and it automatically creates backups (three by default). This wasn’t obvious but is erring on the side of caution. When backing up data to multiple locations, I wouldn’t create archives with the sync tool. I’ve just downloaded Synkron and am optimistic that it will satisfy my sync needs. Thanks for the post and comments. Matus, that’s great news, thank you! Please let me know when the new version comes out so I can update the post accordingly. I’ll also be glad to try it out. Well, if you think about it, backing up overwritten files is a very important feature. If you use Synkron to sync files that are important to you, you will appreciate having an option that could correct any moves that you didnt want Synkron to do. I understand that the feature is hard-to-find, but I had to make some things less visible to make it easy to do a basic sync and not to confuse the users. I have some plans to implement an automatic cleaning option so the temp folder wouldnt get too cluttered after repetitive syncs. Matus, I appreciate your comment, and it’s always a good idea not only to read the documentation, BUT also to design an application well. Most people won’t discover where that checkbox is, or what it does. All they’ll realize, is that, like me, the free space on their hard disk is shrinking. And when they discover the culprit, they’ll remove it, like I did. Blaming me (or other users, for that matter) for not reading the documentation will still not help you fix a hard-to-find feature that eats people’s free space. Keep that in mind, from one application developer to another. What you have come across is not a cache, it is a backup of the files Synkron has overwritten during your synchronisations. It is a good thing if you realise that something you didn’t want to sync was synced and you want to restore it. You can clean the temp files, or restore them to their previous positions through the Restore section (see the icon in the toolbar). You can also disable backing things up by activating the checkbox “Do not backup updated files” in the “Advanced options” in every sync tab (see the “Advanced” checkbox on the bottom of a tab).